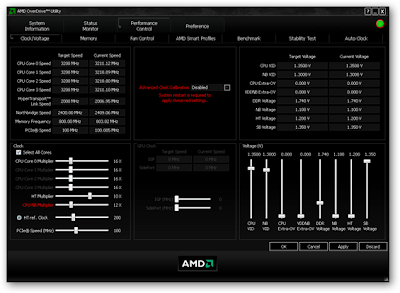 AMD OverDrive™ Utility (AOD) in general provides user the ability to maximize the capability, flexibility, and adjustability of the AMD chipset products; it allows user to tune parameters to ensure system stability, optimize performance, and control cooling/acoustic characteristics. The goal is to provide an all-in-one utility which can deliver all-around stellar operation. AMD CPU and a compatible AMD Chipset motherboard are required for installing and using AMD OverDrive™ utility. Certain features of AMD OverDrive™ utility require a motherboard with compatible BIOS version and may not be available on all supported hardware configurations.